Rohit Suri, MD and president of Jaguar Land Rover India, and Mark Turner, brand director, JLR, overseas, during the launch of the new Land Rover Discovery Tata Motors’ British cash cow, Jaguar Land Rover (JLR, 45 per cent growth in Indian sales in the nine months from this January) is confident of maintaining the momentum, backed by new products. “The last nine months have been extremely well. Our new launches, the XE diesel and F-Pace, picked up the pace. 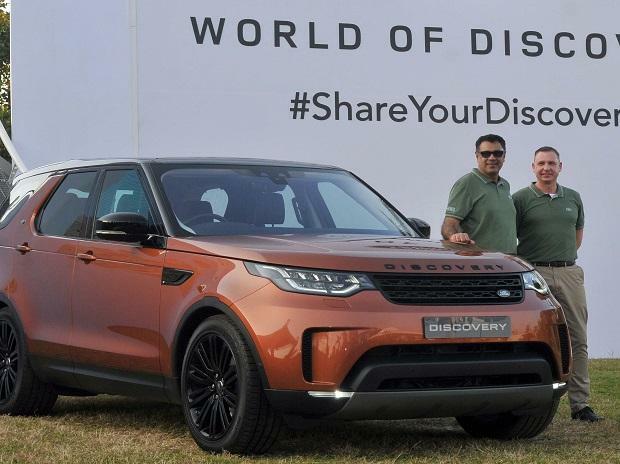 With the new Discovery at Rs 71.38 lakh, we have filled the gap between the Discovery Sport and Range Rover Sport,” said Rohit Suri, president of JLR India. With these launches and of the upcoming Velar, the company hopes to take the India market share to 14 per cent from its present nine per cent, he told Business Standard on Saturday, in an interaction before the Land Rover Discovery launch. The company did not confirm an India launch of the E-Pace. “In 2018, we have plans to knock out our closest competitor to take on the third position,” Suri added. With the implementation of the goods and services tax, prices had been revised to make these competitive, he said. JLR eyeing the third position is a new worry for German luxury carmaker, Audi. In May, it had lost its second position to ‘in-house’ rival BMW, slipping to third. Audi sales in May fell 31 per cent to 7,742 units in India, compared to BMW’s 7,861, a rise of 14 per cent. Apart from new launches, JLR’s strategy for market share includes a focus on petrol engines, strengthening its dealer network and after-sales service. “After-sales service and dealership presence is one of the key factors we are working on. We have set new norms to render best-in-class after-sales service and will expand our dealership in every geography we sight potential,” added Suri. The company has 25 dealerships in India, with a presence in all tier-I and tier-II cities, including the latest in Vijayawada and Lucknow. It will add three showrooms by the year-end. “Earlier, 95 per cent of our models sold were diesel (engines) but after the NCR (Delhi region) diesel ban (on high-engine cars), we noticed a considerable hike in demand for petrol cars. We have taken an early step to launch the Discovery petrol, too,” said Suri. Explaining that JLR had a global portfolio of petrol-powered cars, he said it would be easy to get these into India. At present, about 25 per cent of the JLR volumes sold are of petrol-run vehicles. In India, JLR has priced the Discovery petrol base variant cheaper by Rs 10 lakh to its diesel iteration.